What is the most user-friendly CRM solution? Crowning a particular tool as the “best” CRM solution is a tricky task. Each business has their own needs and demands, and their individual circumstances mean that there is no universal solution best for each and every organisation. That said, we can examine other qualities that can provide some useful steer, and one of these is ease of use. All CRM buyers want their new systems to be “user-friendly” – not least because it helps to address one of the key hurdles to successful CRM implementation, that of adoption. Of course, “user-friendliness” is a little arbitrary, and with circumstances and needs varying wilding from organisation to organisation, identifying a system that is universally “user-friendly” is almost impossible. Nonetheless, we can dig through the vast numbers of customer reviews for CRM tools to get a broad picture of how well-rated various solutions are on average for their ease of use. The interesting thing to highlight upfront is that there is no unanimity in these findings – a look across these different studies reveals no solution universally hailed as the most user-friendly. However, on closer inspection, you will notice that some are ranked more frequently amongst the leaders, particularly Salesforce, Pipedrive, Nimble, Base and Less Annoying CRM. Is CRM a step closer to delivering the Holy Grail? How much do CRM tools cost? What are the hidden costs of CRM? So let’s look at the leaderboards. Customer satisfaction with the set-up process for each product based on reviews by users. User adoption percentage based on reviews and by users. Implementation method used by customers according to answers by G2 Crowd users. The findings of the Winter 2017 CRM Software Implementation Index report reveals that Nimble is the highest-rated CRM tool, with an implementation score of 9.4 out of 10, compared with the average score of 7.81 for the 128 products rated in the report. Pipedrive is ranked second. In the process of rating and ranking its Best CRM Software of 2017, Top Ten Reviews examines ease of use. The score given to each tool represents how easy it is to navigate the software and locate tags and icons. It also considers the overall look and feel of the user interface, with the more intuitive and less cluttered tools receiving higher scores. As part of the testing process, a mock company was created, with the most important tasks carried out on each system, including: adding and importing contacts, creating notes, calling contacts, and designing, creating and sending emails. Top Ten Reviews also tested inventory and employee features, where available. The review concluded that Salesforce was the easiest to use out of those tested, with its system deemed to be intuitive and demanding the least amount of navigation, while helpful information was easily to hand. Capterra’s rankings consider three different criteria: usability (how easy the tool is to use), what customer services are available (how well a vendor helps you get set up and supports ongoing use), and customer reviews (taken from its own website and its sister sites, GetApp and Software Advice). For the Top 20 Most User-Friendly CRM Software report, direct user testing was undertaken, measuring how many seconds and clicks it would take to complete common tasks in a CRM solution, such as: creating a lead; adding a task pertaining to the lead; adding an interaction/note pertaining to the lead; setting a reminder to follow up with the lead; changing the lead’s stats to the next stage in the pipeline; uploading a document to the system; and generating a report. 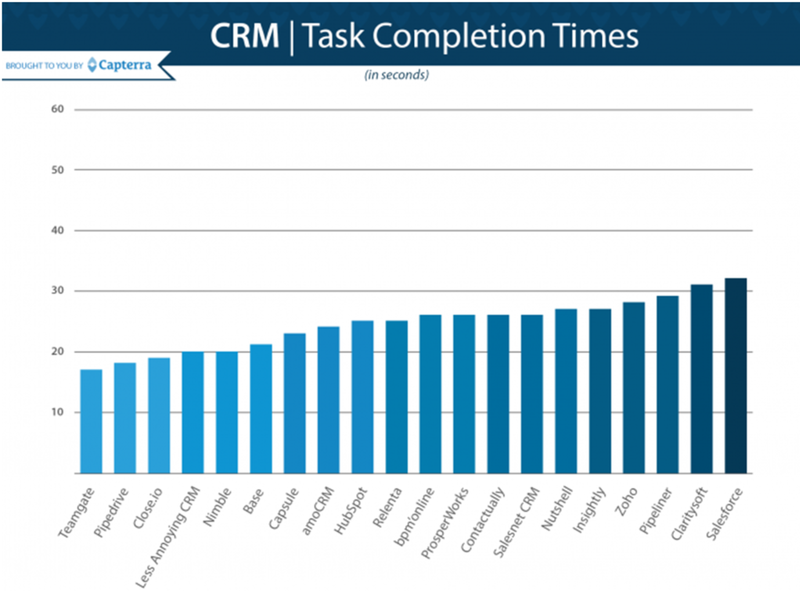 An interesting finding at this stage, is how Salesforce compares to the competition – with longer task completion times than any of the other solutions. However, the picture changes once the other criteria are factored in, with Salesforce clawing back positions after customer reviews and customer service scores are included to generate a final score. Indeed, Salesforce scored maximum points for customer service, in which Capterra examined how easily a user was able to personalise/configure a system, what kind of training was offered, and how many different ways a user could get in touch with a company if they had questions or issues. The champion in Capterra’s rankings, however, is Teamgate. 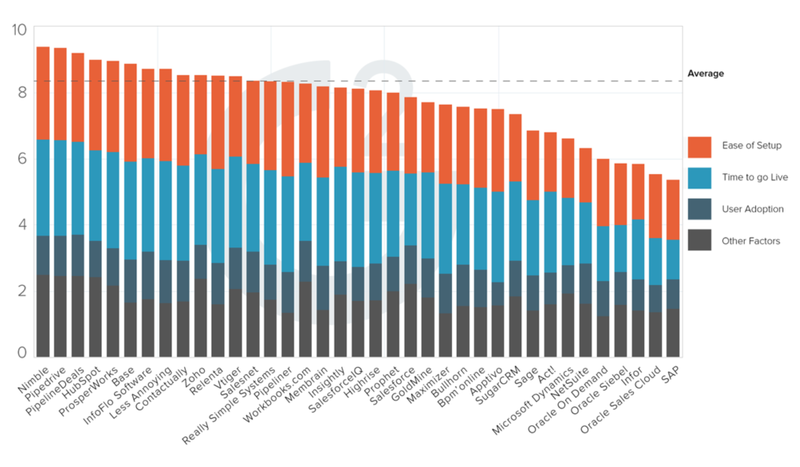 Pipedrive ranked a respectable 4th, with Nimble coming in 6th, and Salesforce in 7th. An infographic summarising the findings is below.